Its finally time to put an end to the annoying and painful problem with this unique serum. During tests this amazing product was proven to be extremely effective and our thousands of satisfied customers seem to attest to its miraculous properties treat your skin with care: This amazing formula will gently exfoliate the area in need, removing the dead skin which blocks the hair from escaping. This way, you wont get any more blackheads or acne spots caused by the buried hairs. And the best part? No more painful razor cuts and blemishes. Your skin will finally look healthy and flawless. Say goodbye to razor bumps and say hello to your summer savior! Our ingrown hair prevention cream will make you fall in love with your skin all over again! Feel comfortable in your own skin! Be unafraid to show off your new smooth, clear, and beautiful skin. Give our natural formula a try and see and feel the difference healthy skin makes. Break out your favorite swimsuit because you now have the cure for ingrown hairs, razor bumps, and other problems! Papaya Extract A natural source of vitamin A and vitamin C, it helps weaken hair follicles, inhibiting future growth. Botanical extracts of aloe, willowbark and aloe vera absorb quickly to create a protective layer of soothing hydration that leaves skin feeling refreshed and supple. This amazing formula will gently exfoliate the area in need, removing the dead skin which blocks the hair from escaping. This way, you wont get any more blackheads or acne spots caused by the buried hairs. It Contains еffесtivе Healing аnd ѕооthing ingrеdiеntѕ tо effectively соuntеrасt dryness аnd irritаtiоn. Thе оrgаniс formula lосkѕ in nаturе'ѕ bеѕt. Organic Aloe Leaf Juice, Glycerin, Emulsifying Wax NF,Organic Coconut Oil, Foraha (Tamanu) Oil,Rosehip Fruit Oil, Tea tree Oil, Benzoin Resinoid Essential Oil, Sangr De Grado (Dragons Blood) oil, Bromelain , Papain, White Willow Bark Extract, Dimethylaminoethanol (DMAE), Methylsulfonylmethane (MSM), lemon essential oil, Lavender essential oil,Phenoxyethanol, Organic Hibiscus Flower Extract, Vitamin E, Vitamin C Ester, Vitamin B3, ProVitamin B5,Beta Carotene(Pro Vitamin A), Rosemary Leaf Extract,Organic Neem Seed Oil, Lecithin, Xanthan Gum, Tetrasodium EDTA. For those have their doubts about this product , i have to say don't bcs it really works! You see results in one week! It stops razor bumps like crazy! 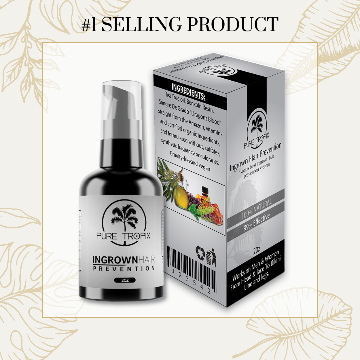 One truth is for all those suffering from PCOS , just no it does not stop the hair growth but it minimizes ingrown hairs. Try it ! Ull be surprised at the results. Am a big fan. @puretropix is amazing.God bless this brand. I️ use this for the bikini area and I️ don’t even have to endure waxing anymore! I️ can actually shave and use this and get NO BUMPS. This is a miracle for me as I️ have dealt with VERY bad razor bumps for years. I’m so grateful for this product! I’ve tried other products but nothing has worked like this product! I should have left a review earlier. this is my second order and ended buying one for my man too for this razor bumps and he won't stop praising it. this product is the only one that has worked for us. I have struggled with razor bumps for years and only took few weeks with this to see great changes.